HORST HERMAN EDUARD LEIPHOLZ was born in Plonhofen, Germany (now in Poland), on 26 September 1919; his parents emigrated to Brazil while he was still small, and he grew up in Curitiba, capital of Paraná state. In 1939 he travelled to Germany to study mathematics and physics at the Technical University of Berlin; at the outbreak of war his travel documents were confiscated and he was drafted into the air force, where he served actively on the eastern front. He was shot down and wounded. He never recovered completely from his war wounds, which caused him pain intermittently for the rest of his life. The division of Germany when the war ended separated him from his wife, who was left in East Germany. He succeeded in bringing her to West Germany; in the process again narrowly escaping death by drowning under the ice of a mountain river. Horst Leipholz worked first as a labourer and construction worker in the reconstruction of Germany after the war. He then studied civil engineering at the Technical Institute of Holzminden, graduated in I 948, and graduated again in 1950 as an architect. He worked professionally in a consulting office in Stuttgart from 1950 until 1958. Also in 1958 he graduated with a diploma in mathematics from the University of Stuttgart. He obtained his doctorate (Dr. Ing.) the following year and his habilitation (Doz. habil.) in 1962 from the same University, where he rose from the position of scientific Assistant to Docent and Professor in 1963. In 1963 he was appointed to a chair in technical mechanics in the faculty of Mechanical Engineering at the University of Karlsruhe. In 1969 he chose to emigrate to Canada, joining the Solid Mechanics Division at the University of Waterloo as professor of civil engineering and later mechanical engineering. Horst Leipholz had a profound respect for the ideas and thoughts of others. He had compassion and understanding. He was therefore used in many administrative posts at the University of Waterloo: from Chairman of the Solid Mechanics Division and the Department of Civil Engineering to Associate Dean for Graduate Studies in Engineering, and then Dean of Graduate Studies of the University. In all these positions he served with distinction. He was distinguished as a teacher. His lectures were superbly organized, most carefully prepared and delivered slowly and lucidly. He had an impres­sive awareness of how each student was absorbing the material. He was extremely popular with students at all levels. His eminence as a teacher was quickly recognized, and he received the University of Waterloo’s Distin­guished Teacher Award the first year it was offered. Horst Leipholz maintained a passionate interest in variational mechanics, and his many publications some 200 scientific papers and 15 books bear witness to his scientific concentration and solid step-by-step development of knowledge in his major field of study: the stability of non-conservative systems. 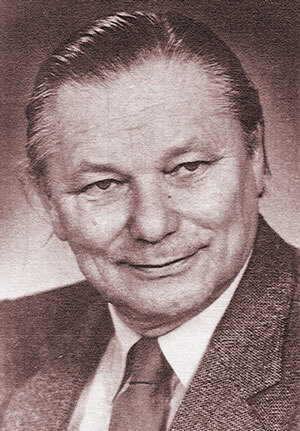 In recognition of his contributions to science and scholarship he was awarded doctorates honoris causae from Carleton University and the Univer­sity of Waterloo; the Cancam Award of the Canadian Congress of Applied Mechanics; and Fellowships of the American Academy of Mechanics, the Engineering Institute of Canada, and the Canadian Society of Mechanical Engineers. Upon retirement in 1986 Horst Leipholz continued to be active in spite of declining health. He died suddenly on a winter day in 1988 on the campus of the University of Waterloo, where he had served with dedication and distinction.